This is an image of the artwork for the next Freightdog decal sheet in 1/72nd scale, this time covering RAF operations in Egypt and Palestine, both pre- and post-WWII, up to the end of British Mandate in 1948. 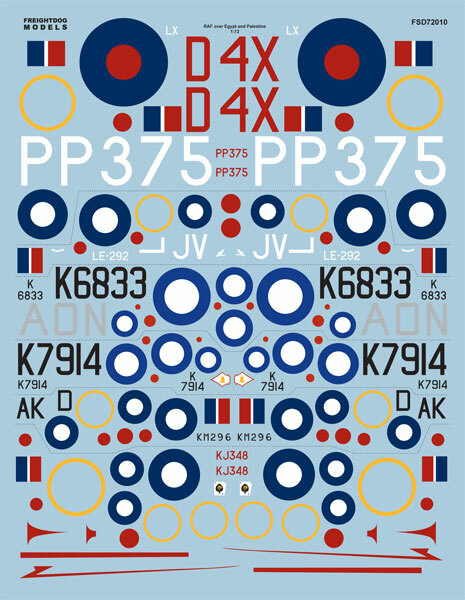 Subjects covered include a HP Halifax A.VII, Gloster Gladiator, Hawker Hind, Hawker Hurricane and an NA Mustang Mk.IV. We hope to have this sheet available by early September.